The NJOY Daily is also available in tobacco, menthol, and Blue+Blackberry flavors. 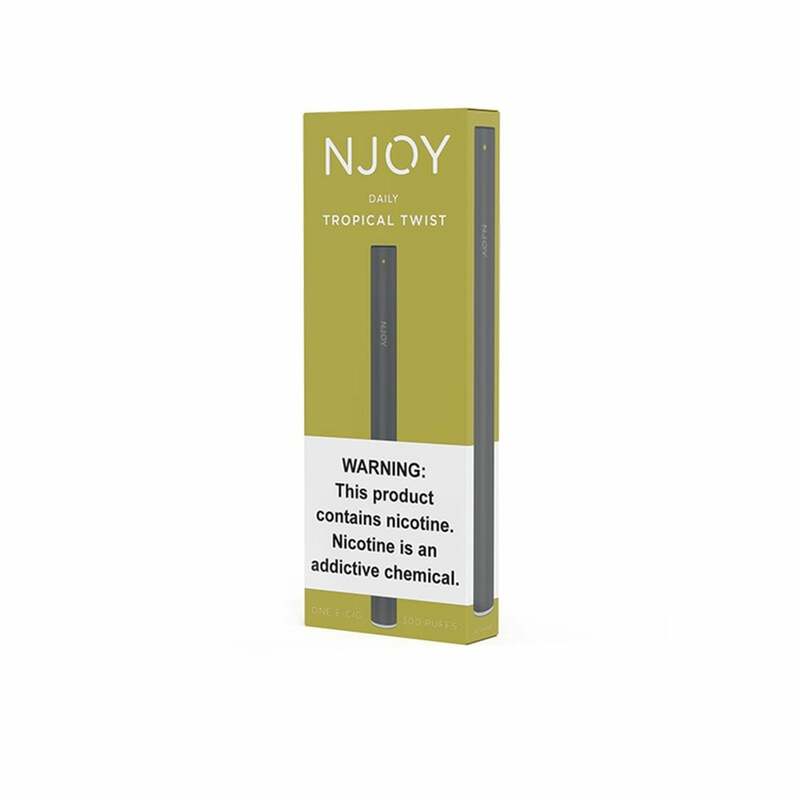 Tropical Twist is another one of NJOY's fruit flavors, offering a sweeter alternative without sacrificing any nicotine hit. Tropical Twist is a mix of pineapple and kiwi flavors. NJOYs feel most like a cigarette to me . Tropical Twist has a better , more citrus like taste to me than the melon flavor . I also like the cool menthols.I they are as close to Newports as a disposable e cig is going to get . I was a 1-3 pack a day smoker and the muscle memory and feel of the NJOY disposables has been very effective in satisfying most of if not all of my cigarette habits . Again one of my favorites. I like this one in the evening its like having a treat or a mix drink and getting to enjoy the relaxing of a vap all in one. The NJOY e cigs are as close to a cigarette as an e cig can get . I prefer the Tropical Twist pineapple / kiwi flavor but the berry or menthol will do pretty well too . They feel like a smoke in my hand and draw a bit like one as well . The filter end is soft like a cigarette filter and is easy to hold in my mouth like a cigarette . The only drawback of the NJOYs is that they don't last 300 puffs . 300 precocious smoking , beer drinking toddler puffs maybe but not grown adult drags/ draws . I liked the Daily Tropical Twist Flavor. Tastes and smells good. love my njoy ! they really feel like a cigarette. i don’t love the lifespan , it’s nowhere near 300 puffs unless the manufacturers mean tiny baby monkey puffs . Only wish they made this in extra. It is a little light on flavor but I ordered them on Friday and got them Monday. I love this company!